The relationship between TV and mobile apps is evolving rapidly. While apps that let you ‘check in’ to the shows you’re watching seemed innovative not so long ago, real-time viewing guides like Zeebox and Boxfish are the flavor of the moment. 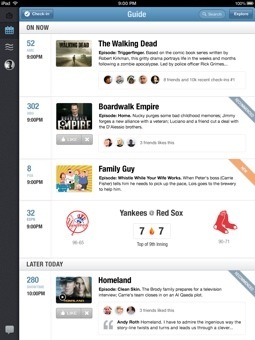 To that end, one of the original media check-in apps, GetGlue is itself transforming into a content guide. 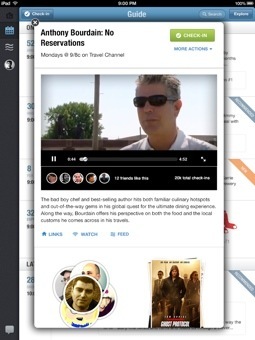 GetGlue HD launches today on the iPad in the US as a personalized calendar of viewing recommendations. Simultaneously, the startup is announcing that it has reached the 3 million registered user mark, and a total of 500 million check-ins to TV shows and movies. Scrolling through the new app, you’ll see upcoming episodes of shows you like, along with US TV schedule highlights such as big upcoming premieres and events like the Emmys, Oscars and Super Bowl. Similar to social viewing guide app Tweek, the app will recommend content available from online sources like Netflix, iTunes and Amazon in addition to broadcast television. In addition to TV shows, schedules, stats and live scores for sports teams and a guide to upcoming movies in theaters are built in, too. 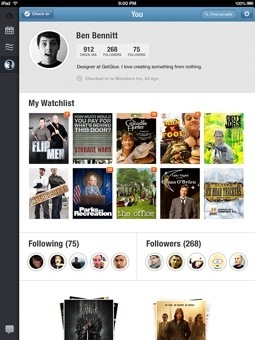 GetGlue isn’t abandoning check-ins entirely (they build up the app’s knowledge of what you like watching, after all). Instead, checking in to a show now opens up a ‘second screen’ experience reminiscent of Zeebox. Videos, images, tweets, and reviews of the show are surfaced in addition to the ability to chat with others who are checked into the same show. You may remember that GetGlue has traditionally let you check in to books, music and even thoughts – the new app focuses solely on TV and movies, although (at least for the time being) you can still check into other things with the startups website and other apps. Check-in apps were only ever going to be a novelty – a feature rather than a service. 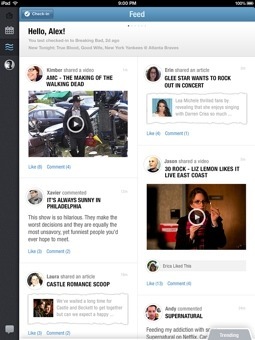 Just as Foursquare has developed into a location discovery platform, GetGlue is taking the same path with media. GetGlueHD is available for iPad today and will be rolled out for iPhone, Android and the Web later in the year.